When One Betrays The Other. A crude phrase but one I employ regularly when speaking of the ruling classes is "two cheeks of the same....". If ever a PM showed the arrogance of power to betray the loyalty of his electoral Tory College, they are his disgraceful and unforgivable acts. One element of political power and might is the knowledge of secrets which, by their very existence, we are not, unlike Privy Councillors, privy to. However, such is the nature of hubris these cretinous "servants" of the people, they act with a superior and arrogant air beliying our part in electing, or at least voting, to establish their position. Now most people, until very recently have considered their political and social leanings to influence their cross on the ballot paper. Where decades of loyalty to a given belief in the Party they have supported, the sense of disloyalty, by changing that cross, has often stayed the deed. Let us, however, compare loyalty with obsessive fanaticism. Suicide bombers, terrorists' slaughter of innocent victims and the casual air of Bliarite warmongering, aped by Camoron, test the boundary between the two considerations. If a leader rides rough shod over his supporters at what point do they abandon their own loyalty and consider alternatives? 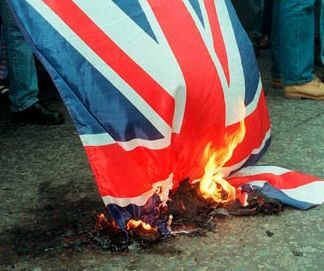 In the UK, fanatical and disproportionate responses to betrayal are slow to evolve. A change of or ejection of a treacherous and selfish leader, pursuing, as did his hero, Bliar, a "legacy", is the most likely outcome for a supporter. Less frequent but not unheard of, is "crossing the floor" by elected representatives or completing that hovered cross in a different box. 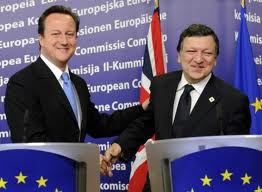 Yet today gives us a new environment of undemocratic influence from The EUSSR. To this end all of the three Parties holding sway are as one. In the corridors of fading Westminster power all are fanatically united in support of The EU, with no sense whatsoever of the betrayal of Public majority will. Whenever a smidgeon of concern crosses their minds, a combined onslaught is made to promote the despicable and corrupt, unaccountable and fraudulent State, they so blindly nurture. Now if we consider the propaganda employed, the "gay marriage" grotesque tactical diversions and the horrendous nature of a Tory PM backside licking the Labour hierarchy, we begin to witness a betrayal and fanaticism not dissimilar to the violence of civil war now prevalent in The Middle East. Sure, we have yet to observe, bar briefly in 2011, the anger bubbling away beneath this collective dictatorship now subsuming us all. Well, if we momentarily discount the recent UKIP success but it can't surely be long before loyal and decent Conservative core supporters realise the following. That leaving this now defunct and disparate, no longer conserving of anything we used to hold precious, rump of a once proud and successful movement, would not be an act of betrayal but of loyalty to that held dear. Just as failed banks have given up their branches, so the Conservatives should look to do the same and create new and more real Conservative Branches under the banner of UKIP. Divert funds and donations away from the controlling Westminster and Downing Street rump and make a stand for deep seated beliefs. Self determination and responsibility, self governance and democratic implementation of the majority will. Common sense in all matters, economic strength which nurtures and pays for the weak and vulnerable whilst motivating entrepreneurs, rather than than the self serving political establishment. The common sense approach to live and let live whilst obedient to those laws which protect and aid decency. Compare all of that foregoing philosophy with the nature of the UK today. Overwhelming overcrowding forced on us by the last "Government" of mad men and zealots. Asian and Muslim connected racist abuse of young, white girls and sometimes boys. Behaviour once unheard of and a betrayal of a once, close on, civilised nation. An education system used to pour scorn on the veterans of two world wars whilst schooled in the greatness of Bliar and Labours' disgraceful dodgy dossier excuses for slaughter of the innocents. Do those warmongers ever stop to hear the anguish now enveloping the Iraqi people? One soon to engulf The Afghan population. Again we look at betrayal on a grand scale by the fanaticism and greed of a political class, steeped in immorality and selfishness. We need to show loyalty, once easily given to the now defunct Party system of the UK, to values we all, deep down share. Enough is enough.As ever in the modern history of the UK it is for the real Conservatives to wrestle back a way of life and principle that worked. I see only one chance to do that and it is not being disloyal. Many true Labour supporters would do well to follow, as indeed indications from Rotherham suggest they are showing the way! I will sign off today with this rather enjoyable clip of real politicians showing how the BBC smug lefties should be handled! Is such refreshing change really coming? I do hope so. Loved it! Absolutely wonderful! The audacity that someone likes to smoke and drink - Gavin Esler was well and truly owned.